For over 30 years, we have been a family owned and operated brokerage firm based on Eastern Long Island, NY specializing in the sale of yachts from 25 feet and up in length. We also specialize in pre-owned Egg Harbors, as we are former Egg Harbor Dealers (1987-1991). From 1996 to 2011, we maintained office locations at both Brewer Yacht Yard Greenport and Brewer Stirling Harbor Marina, in Greenport, NY, as the exclusive onsite broker. Given the increased internet nature of the business these days, we gave up the expensive brick and mortar locations in 2012 to focus more on mobility. This allowed us to keep our overhead much lower than the larger brokerages and in turn provides us more flexibility in negotiations. 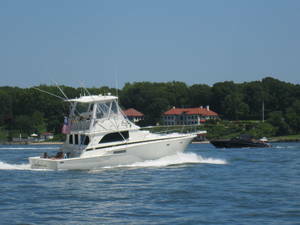 We serve all of Long Island and personally inspect and create a detailed specification sheet on each boat we list, then advertise both locally and internationally. Offering personal service, with a global reach, allows us to provide effective service to both buyers and sellers. Give us a call to buy a boat or to sell yours! We sell both Power and Sail! Garmin 7615 15" Radar/Plotter/Fishfinder, Auto Pilot.